2. Ensure that everything is fresh and clean. 3. Always choose fruits and vegetables and go organic. 4. Start with simple recipes. 5. 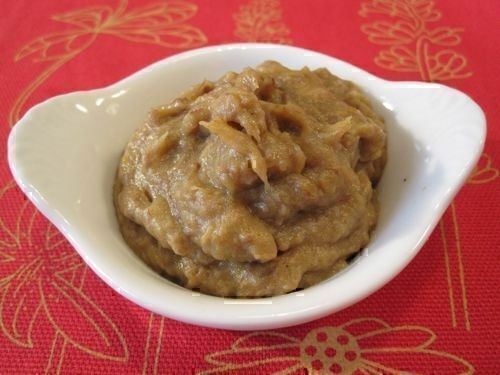 Don’t save leftover baby food. 6. Avoid adding salt and sugar. 7. Offer food options in a variety of preparations. 8. Invest in a durable blender or food processor. 9. You can make big batches. 10. Be extra careful when heating baby food using the microwave. 13. Don’t expect them to eat three times a day when they’re still starting out with solids. 14. Don’t stress it out. It’s crucial to maintain a calm and fun environment. 15. When making baby food in bulk, find several storage options, but you must also know how long before it’s considered unsafe for consumption. 16. You shouldn’t stop giving milk even when they have already started eating solids. It is one of my favourites because carrots contain so many nutrients. Aside from high beta carotene content, it also has calcium, and Vitamins A and C.
Put water in a saucepan and bring to a boil. Adjust to medium heat and cook carrots for about 10-15 minutes or until tender. Drain and rinse the carrots in cold water to avoid overcooking them. If you plan on adding the sweet potatoes, steam them until soft. Put the carrots (and sweet potato) in the food processor and blitz until the texture is smooth. It wouldn’t be called ‘Nature’s Perfect Food’ for nothing. Avocado contains vitamins, nutrients and healthy fat. If you want something more specific, it has iron, Vitamin E, fibre, potassium and folate. Plus, because of its creamy texture, it’s easier to eat and swallow. 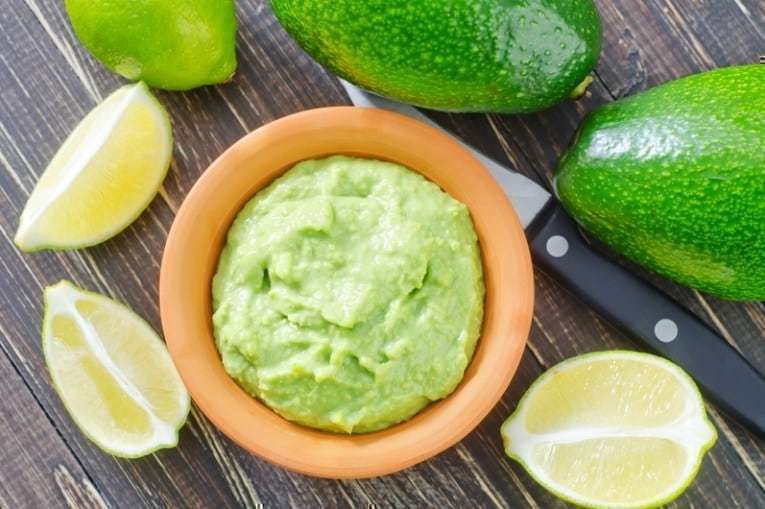 You can mash the avocado using a fork if you want a softer texture, or you can blend it until you reach the desired consistency. To thin it, you can add formula or breast milk. Let it cool before storing or serving. Peas boost the fibre to the baby’s diet which, in turn, will help control cholesterol and combat obesity. Add water to the peas and steam for no more than 2 minutes. Strain the peas and put in the blender or food processor. Add milk slowly to achieve desired consistency. Serve when it has cooled down. Instead of using white rice, try the much healthier option which is the brown variety. Not only does it contain a significant amount of fibre, but it also has manganese and selenium. Ground the rice in a food processor until it becomes powdery. Measure ¼ cup of rice powder. Add the rice powder slowly while stirring the mixture. Let it simmer for around 10 minutes, with an occasional stir. To thin it out, add formula or breast milk. Rolled oats don't have any sodium or cholesterol. But it has carbohydrates, protein, iron, B vitamins thiamin and riboflavin, manganese, selenium and amino acids. Ground the oats in a blender or food processor. Measure ¼ cup of the ground oats and add to the liquid. Let it simmer for 10 minutes while stirring occasionally. Add milk to thin out the texture. Barley is an excellent source of fibre, B vitamins, amino acids, iron, copper, manganese, and phosphorus. Soak the organic barley seeds overnight making sure to cover all the seeds with water. The next day, add the barley and 3 cups of water in a pressure cooker. Wait for five whistles and let it simmer for around 15-20 minutes. Once cooked, pour in the ½ cup water and chopped apples. Cook for another 2 minutes. Add the mixture to a blender and blitz away until smooth. Just because you want to load on nutritious foods doesn’t mean they shouldn’t be tasty. 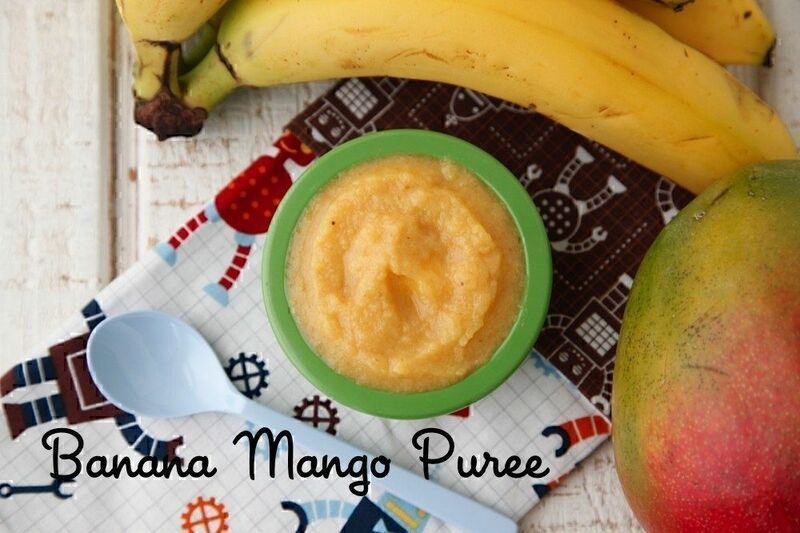 This baby food is sweet but still healthy. Cut both the apple and pear into dices. Steam the apple first for two minutes. Then, add the pears and steam for another 10 minutes. Blend until you achieve the desired consistency. You can thin out the puree with milk. To provide variety in texture for the baby, you can make it chunky instead of smooth. Mango contains more than 20 vitamins and minerals while the banana has fibre, potassium, vitamin C and manganese to name a few. Put the banana and mango chunks into the food processor and pulse until smooth. Add milk slowly to thin out the consistency. You can make this into popsicles (best for teething babies) or pour into an ice cube tray for future use. 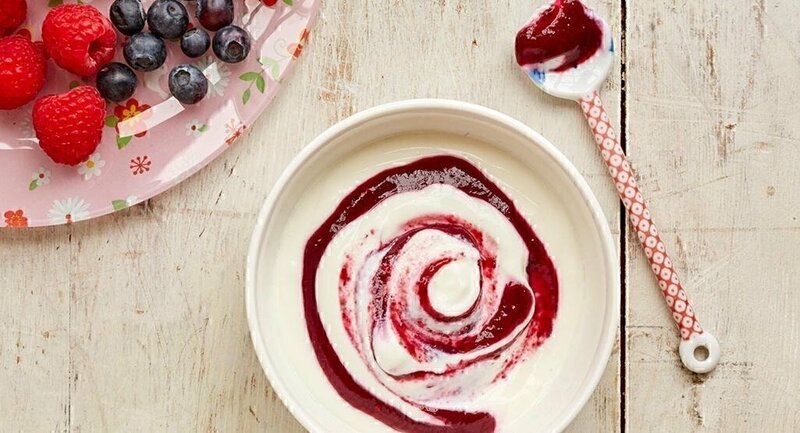 Yoghurt contains various nutrients such as calcium and protein. It’s also packed with vitamins. The best type is the unsweetened and pasteurised ones made from whole milk. Add both the blueberries and raspberries into the food processor and blitz away. Once smooth, strain using a fine-mesh sieve. Pour the mixture into a medium saucepan and adjust to the medium heat. Simmer until it starts to thicken, around five minutes. Before serving, add yoghurt and swirl. Aside from essential vitamins and minerals, pumpkin also packs antioxidants and vitamin A. Thyme, on the other hand, is an excellent source of Vitamin A, C and K. It also has folate, calcium, iron, magnesium and potassium. After washing the pumpkin, slice off the top and cut lengthwise. Remove everything inside such as the strings and seeds.Take note that it’s not safe for babies and even toddlers to consume pumpkin seeds, so if you want to give it to them, you may need to refer to your paediatrician. Cut into chunks and put on a baking sheet. Roast for 45-60 minutes or until tender. Add into a food processor. Mix in the thyme and pulse until you achieve the desired consistency. Add milk to thin out. Heated spinach contains protein, fibre, Vitamins A and E, calcium and iron. White yam has fibre, the B-complex group of vitamins and other minerals. Add the yams to the water and bring to a boil. Let it simmer and cook the yams for around 10 minutes. Add the spinach and continue cooking until they’re both tender. Allow it to cool before adding to a food processor. 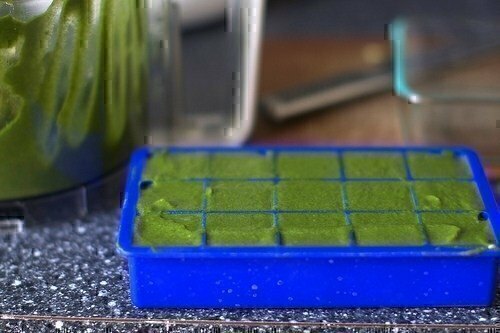 Because this yields about 3 cups of puree, you can store some of these by putting them in an ice cube tray and freezing. 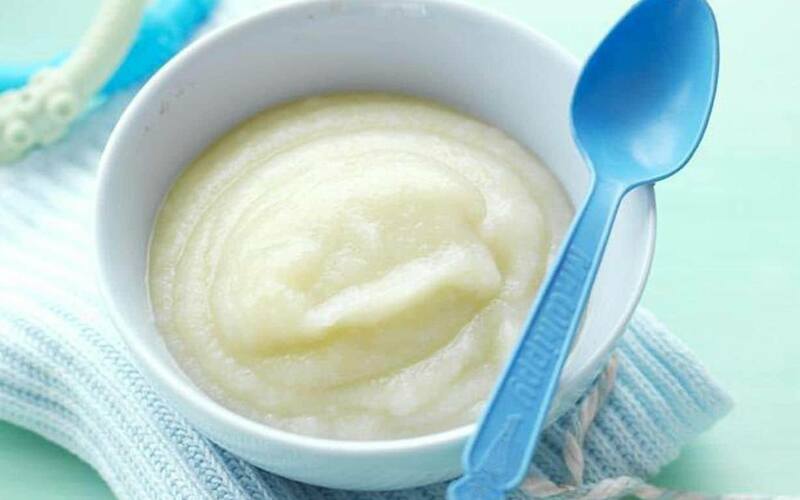 This baby food recipe is slightly more complicated than the previous ones mostly because the preparation time is longer. But that’s not to say it will be hard to pull off. 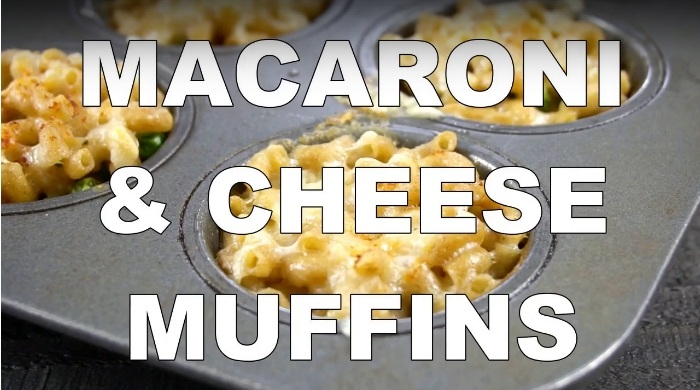 It’s not the usual two or three-ingredient puree, but it will be worth it, I promise. Use a heavy bottom pot, pour the oil and put in medium heat. Add the beef chunks, searing for 2-3 minutes on each side. Add the onion, carrots, potato, and water. Adjust the heat to low and cover the pot. Cook for 1 hour and 15 minutes – check if the beef’s tender. Let it cool slightly before adding everything to a food processor. Pulse away until you achieve desired consistency. Quinoa contains protein, and because of its nutty flavour, it has a certain deliciousness that kids and even babies will love. It also has calcium, phosphorus, fibre, iron, and vitamins E and B. Banana is often called a ‘power food’ because of its potassium content and numerous vitamins. 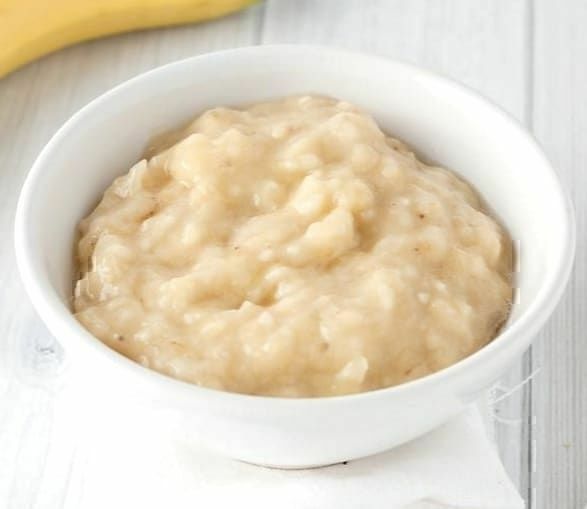 Put the banana slices in the bowl and mash it using a fork. Pour the quinoa and mix. Add the milk or yoghurt and stir. 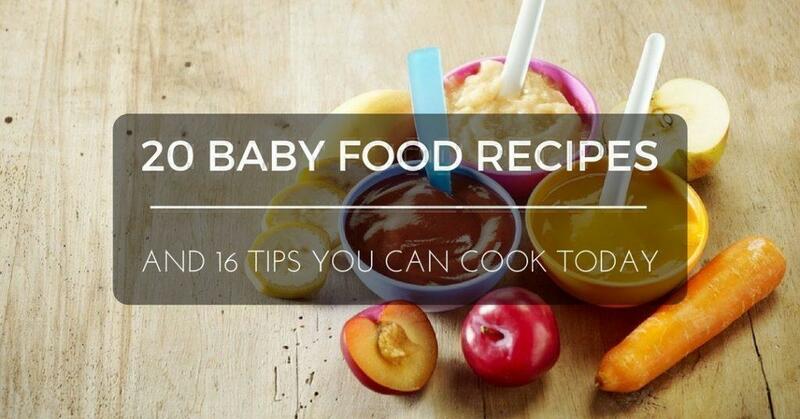 Don’t worry about the chunks because your baby will enjoy something new to his/her palate. Blueberry is a superfood that contains several micronutrients such as zinc, magnesium, B-complex, and vitamins A, E and K.
Bring the water to a boil. Add the blueberries and let it simmer for about 15 minutes or until the fruits become soft. Separate the liquid from the blueberries and set it aside. Add the latter to a food processor and pulse. To thin the mixture, you can add a few teaspoons of the liquid. Add the banana and yoghurt and pulse it again until smooth. Aside from increased focus and improved vision, white fish also helps enhance the baby’s immunity. Cut the fish into four pieces. Put tin foil under each piece. Add carrots, cheese and zucchini into each one of them, making sure the distribution is equal. Add one tsp of milk and some dill into the four parts. Wrap securely before putting on a baking tray. 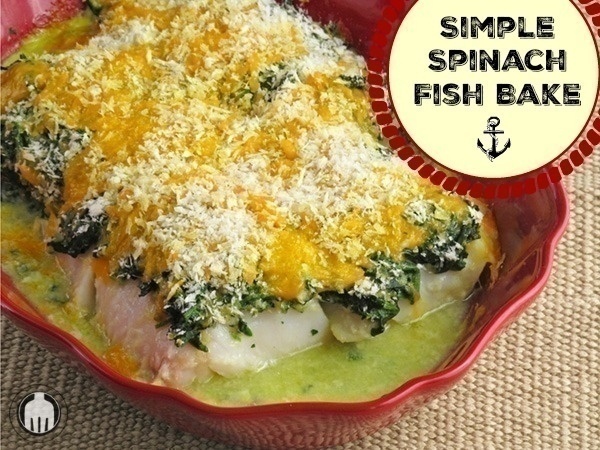 Serve with brown rice or mashed potatoes. 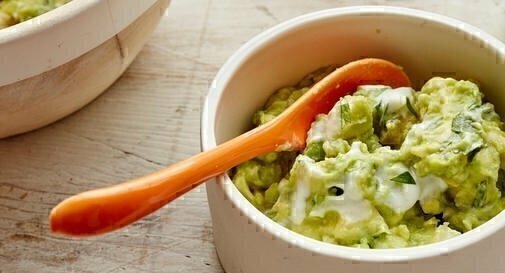 This recipe combines the nutritional benefits the babies can get from avocado, lime, yoghurt and fresh cilantro. 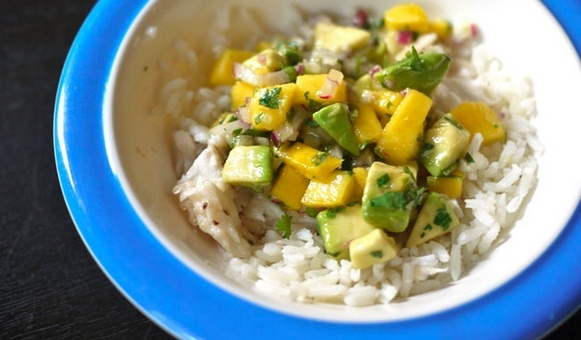 Cut the avocado into chunks and add to a bowl. Add cilantro, yoghurt and lime. Because there are fewer restrictions at this age, you can now experiment with various recipes which they (and the rest of the family) can enjoy. Combine mashed potatoes, parmesan cheese, 3 tbsp. 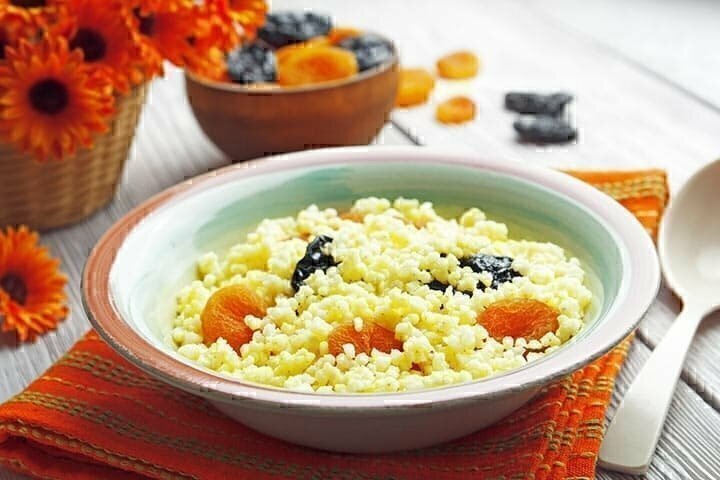 Flour and egg into a bowl and mix. Take a scoop and mould into small patties. Put the remaining flour on a plate and use it for coating. Adjust to medium heat and coat the pan with a thin layer of butter. Sear each patty for three minutes on each side. Follow package instructions in boiling the macaroni. Melt the butter in a skillet and add the flour. Adjust to medium heat and whisk together for a few minutes. Slowly add the milk while whisking for about five minutes. Continue whisking until it starts to thicken. Remove the skillet and add the cheese and cooked macaroni. 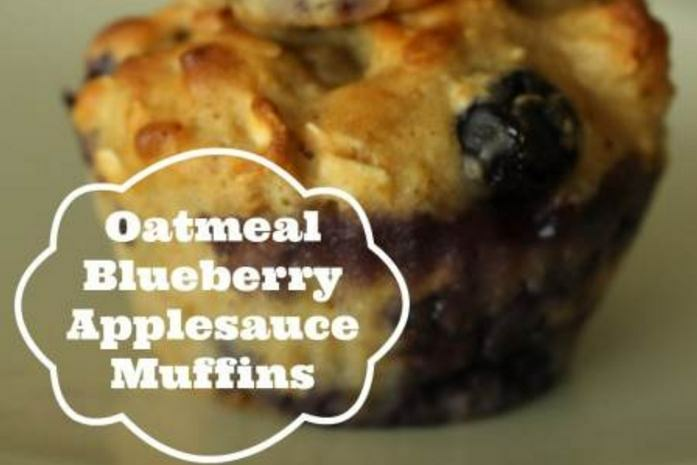 For each muffin cup, fill with two tbsp. of macaroni and cheese. Add some broccoli or peas before adding another layer of macaroni and cheese. You can serve this for breakfast and snacks. Even the whole family can enjoy it because it’s both healthy and delicious. 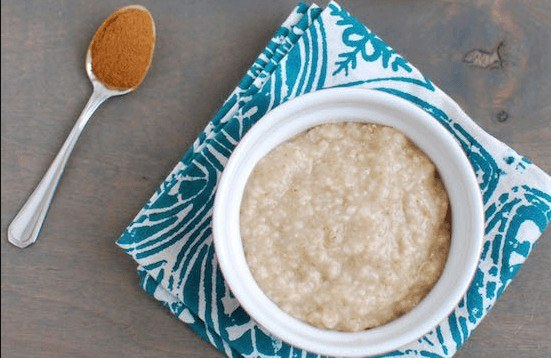 In a large bowl, combine all the dry ingredients (flour, rolled oats, baking powder, soda, salt, and cinnamon). 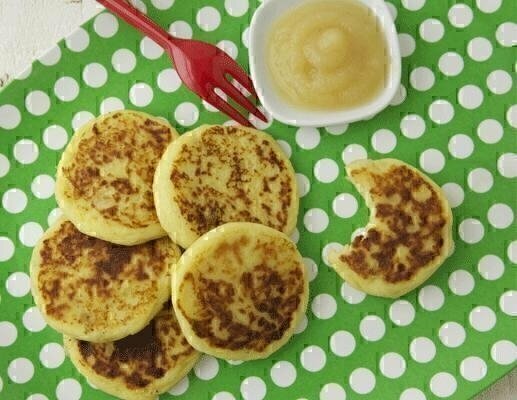 In another bowl, mix the applesauce, yoghurt, egg, brown sugar, and canola oil. Make a well in the large bowl and add the applesauce mixture while stirring. Fill 2/3 of each muffin cup. Bake for around 16-18 minutes. You can test if they’re ready using a toothpick (poke the middle of the muffin, and it should come out clean). Even if you’re the last person to enjoy the kitchen, there’s no need to worry about anything because first off, it’s different from adult food because this is less complicated. Sometimes, you don’t even have to measure anything. The baby should be at around 4-6 months, but this will depend mainly whether they are developmentally and physically ready. Some of the signs you have to look for include the following: has head control and can sit well without any support, absence of tongue-thrust reflex, has developed the pincer grasp and the baby shows readiness and eagerness to participate during meal times. They should be willing to chew and may even try to grab the foods you are holding. If you’re not sure, you can ask for help from your doctor to assess the child. I know this is too basic but sometimes, in our rush to get everything done, we tend to forget to wash our hands. Remember that the baby still doesn’t have a fully developed immune system yet and they will need all the protection they can get because they are still susceptible to a variety of diseases. You also have to make sure all the equipment and tools you will sure are cleaned. For the fruits and vegetables, you have to wash them as soon as possible even if you won’t use them immediately. You should clean up everything before storing. It goes without saying that you want your baby’s first foods to be nothing but healthy. Some may opt for instant food but even pediatricians agree it’s not the best option. 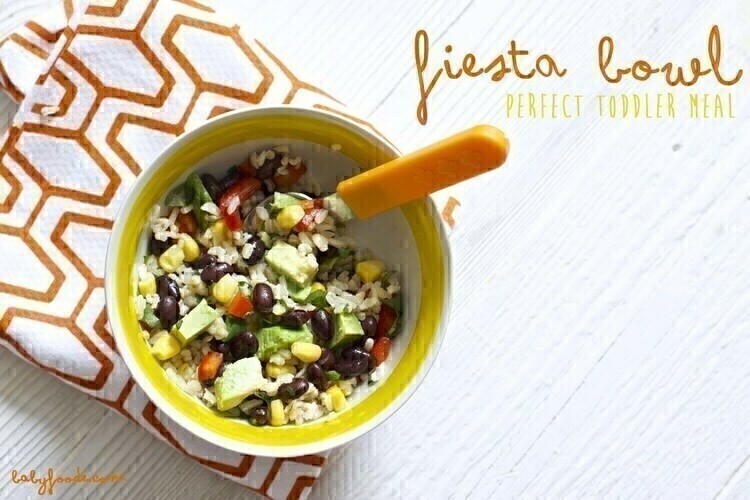 Aside from the fact that one serving is already packed with so much vitamins and nutrients necessary for the child’s health and development, they also get to appreciate a variety of tastes and textures, of course depending on how you prepare it. Besides, that’s the whole point of making your own baby food – you know what ingredients you incorporate in every meal. If you’re new to this, you don’t go overboard and stock on ingredients to make complicated dishes. You can mash or puree one vegetable at a time. The reason isn’t just to save you time but also so you can watch out for any possible allergic reactions. Besides, you have to introduce new foods at least every 2 or 3 days so you can quickly pinpoint the culprit if your child gets allergies. It may be common for babies to exhibit untoward reactions to eggs but sometimes, there are those who get rashes and other symptoms from commonly used fruits and vegetables. It can be tempting to use whatever’s left from their breakfast for consumption later but it’s a big no-no even if you think it’s a waste to throw it away. Bear in mind that while eating, your baby’s saliva could get into the food and that makes it prone to bacterial growth. To avoid any leftovers, you can feed them with a small serving and only add later. Safety is always the priority and as I have mentioned earlier, they are vulnerable to diseases once exposed. You can minimize the risk with easy steps like this. It may taste bland but that’s okay because babies’ kidneys still cannot tolerate high amounts of sodium and it may be dangerous in the long run. Again, this is why it’s much better to stick to all-natural and organic baby food instead of using ingredients laden with preservatives (such as canned beans). Sure, it’s not as time-consuming as doing it yourself but it has its downsides – DIY baby foods are healthier if you use the right ingredients. For me, I try to avoid anything canned or packed as much as possible. Nothing beats good ‘ole fresh items to feed your little one. I know it can be frustrating to mums when the child refuses to eat something healthy like butternut squash, avocado or beans. The thing is, you shouldn’t give up but you also shouldn’t force it to them. Remember, mealtimes should be fun and enjoyable. Then again, take advantage of this time to introduce their palate to different textures and flavors. If they don’t like potatoes at first try, you can attempt again by mashing, pureeing or baking it. Likewise, if they already have a favorite, don’t prepare it all the time to give way to other foods. I once made the mistake of buying a cheap one thinking it won’t be so heartbreaking if it broke. The sad part is it gave up on me just a few days after the purchase. So I had to go for something strong enough to withstand rough usage on a daily basis. Before I learned the ice cube tray trick (which I will talk about later), I would puree and blend twice a day. Basically, you have to think of it as an investment especially if you’re not practicing the Baby Led Weaning method because you have to use it until the baby can transition to something more solid. 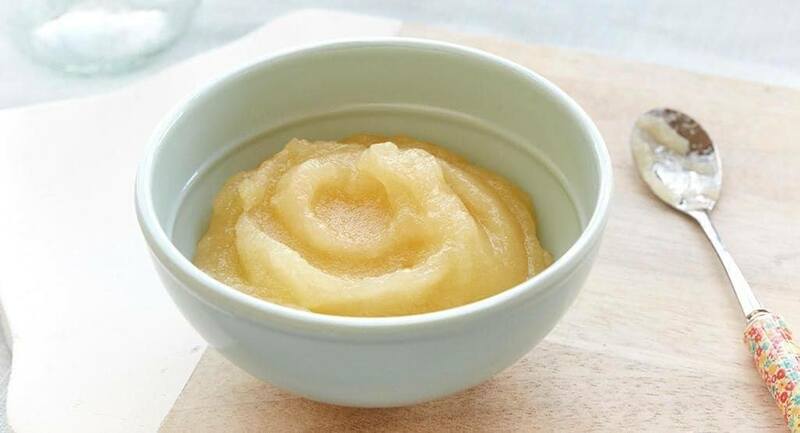 To save time and electricity, you can whip up baby food in advance. It’s very simple, actually. Once done, put them in the trays and freeze. Then if you’re about to use it, let it thaw. This is way safer than using baby jars because those are made of glass and thus, it can crack and break in the freezer which is dangerous. Once frozen, you just pop out the food cubes and put them inside a sealed plastic bag. While you can still use them more than a week later, it’s still best to consume ASAP. I’ve never used this kitchen equipment to be honest. It’s because it doesn’t heat the food evenly and often times, it just heats up the container. However, should you decide to microwave (don’t go for more than 15 seconds), watch out for the hot spots and let it cool before feeding to the child. Stir it and test the temperature before giving it to the baby – what I like to do is pour a small amount on the inside of my wrist to ensure it’s safe for eating. The logic is simple: if it’s bad for you, then it’s the same thing for your child. I understand the appeal of letting them have some French fries or chicken nuggets but they’re not getting any nutrient from it. And those foods are laden with so much fat and sodium. Don’t even get me started on the preservatives. You see, McDonald’s is never a healthy option for anyone. It’s delicious and appetizing, yes, but at the end of the day, it does more harm than good. If you want to serve something similar but healthier, you can make your own baked sweet potato fries. Early on, you can let your baby join you during meal times. You can even take them to kid-friendly restaurants! The rationale behind it is so they will know and understand the value of food. It’s also good for them to see other family members bonding over foods and enjoying it. They will grow up looking forward to meal times because it’s such a pleasant time for everyone. They’re still new to this and you shouldn’t overwhelm their digestive system. They will gradually transition to eating just like adults but for now, just take it slow. Don’t force them to eat something they don’t want because it will only end badly. Besides, you will know when they’re full because they’ll start playing with the food and probably throw it on the floor or to you. Although you don’t want them to play with the food, you shouldn’t be too strict or uptight with their eating either. As I already wrote, their first introduction to solids shouldn’t be stressful. Instead, consider this an opportunity for learning and experimentation because they get to try various shapes, textures and tastes. For baby jars with lids, you can put it inside the ref but it must be consumed no more than 2 days. If you froze it in an ice cube tray and stored inside a sealed plastic bag, you can freeze it for two months. Aside from using the microwave, you can thaw the cubed food by putting the plastic into a bowl of warm water. You see, until one year old, their primary source of nutrition is still milk. Yes, even if they have regular eating habits. At this time, they’re still learning the ropes in eating – chewing, swallowing, holding the pieces. Just because they have nutritious foods in their diet doesn’t mean you should cut back on their milk. 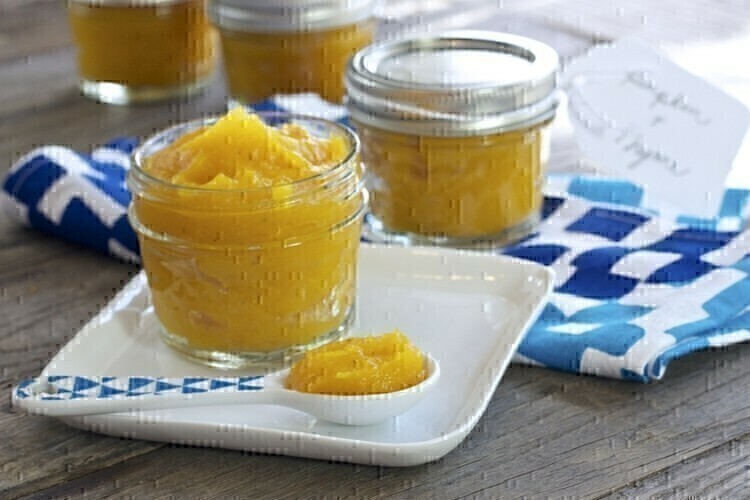 They may have restrictions during the first year, but these baby food recipes﻿﻿﻿ prove that you can incorporate healthy ingredients and whip up tasty meals. It’s a win-win situation for both of you. Besides, you don’t have to be an expert in the kitchen to make purees, trust me; I can honestly attest to this. So if you’re wondering what you should prepare next, don’t be afraid to experiment because most fruits and vegetables go well together. Have fun cooking!